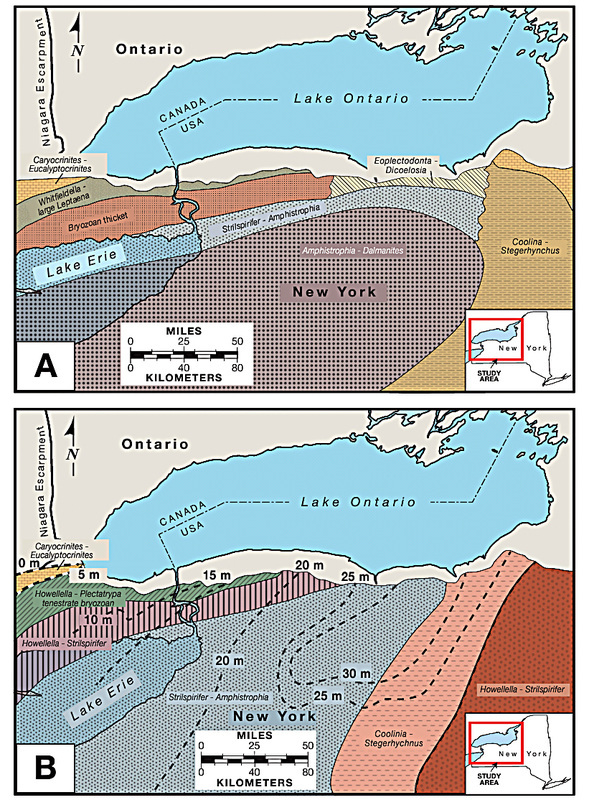 Reconstructions of the northern Appalachian basin during the deposition of the Rochester Shale in the mid Silurian; note general parallelism between the facies belts and the present day Niagara Escarpment belt and deepening to the southwest. A) reconstruction for deposition of the Lewiston Member, B submember. B) reconstruction of Lewiston E; note bryozoan belt to the north, approximately along the Niagara Escarpment outcrop belt. Names of communities or biofacies (communities) belts are based on common brachiopods and other fossils characteristic of particular fossil assemblages. Dotted lines are isopachs showing the thickness of the Rochester Shale at different localities.